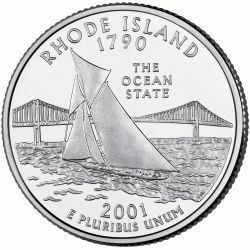 Rhode Island State Quarters are the 13th variety in a series of fifty design changes over a ten year period from 1999 to 2008. This Quarter was released into circulation on May 21, 2001. The reverse of the coin shows a sailboat on the open sea in Narragansett Bay, Rhode Island. The coin also has the Pell Bridge in the background behind the sailboat. The reverse of the coin bears the inscriptions "RHODE ISLAND 1790", "THE OCEAN STATE", and "E PLURIBUS UNUM" along with the date of 2001.